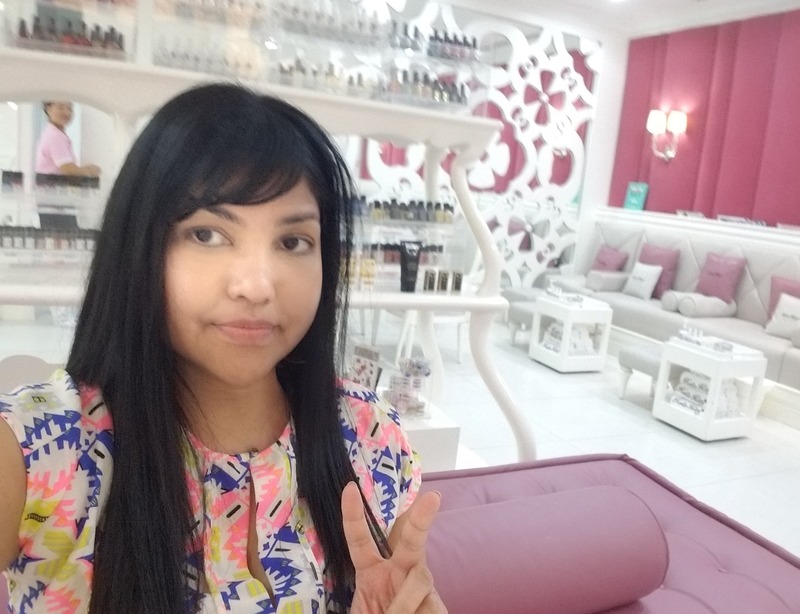 As I was going to attend the Hello Kitty run in Dubai, I took the opportunity to also enjoy the Hello Kitty beauty spa ! Unlike running, I obviously like massages ! 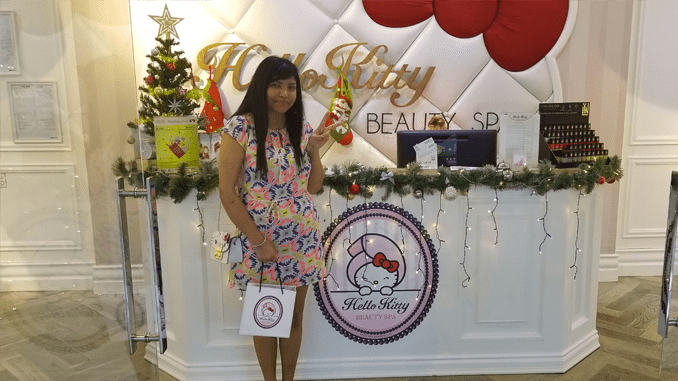 In fact, there are two Hello Kitty beauty spa in Dubai : The first at the Dubai Mall and the second at the Town Center Mall which is smaller and almost empty. I chose the one in Town Center because I had a voucher on cobone that allowed me to book a massage really cheapy 23$ ! If you compare, a massage in France in an institute costs not far from $ 80. The spa also offers manicures, pedicures, facial massage, haircut and other benefits ! You can directly chech their website to see more details ! The entrance is really classy and pretty with the quilted Hello Kitty hanging on the wall ! I would like the same in my own room ! At first, I wondered where this was going because at the entrance, it’s a bit narrow ! And actually there is a door on the right that leads to the nail salon ! But the massage was going on in an other room where you have to cross a room full of Hello Kitty plush ! Too cute ! That’s the room where I had my massage ! Outside the Hello Kitty decor, the masseuse was also very kind and the massage was good as well ! Even though at the end of the massage, she was trying to sell me a massage product. I had to tell her that I was not interested and she did a little grimace ! Plus it’s not even the product she used on me. I only noticed it at the end, but there is a showcase full of Hello Kitty treats at the entrance of the spa ! Very cute even though I don’t eat sweets! So objectively, and I can only speak about the massage service, because that’s what I chose, I was satisfied and I recommend it with the Cobone voucher for any Hello Kitty fans. 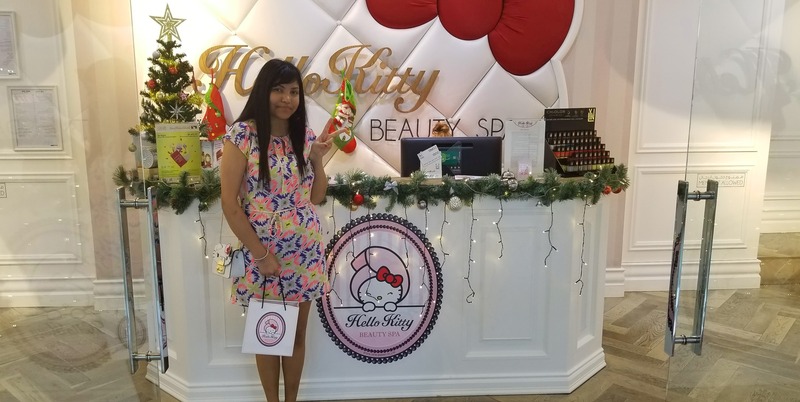 There are also other discounts for the same Hello Kitty beauty spa for manicures, coloring, and facial skin but don’t be fooled by beauticians !